My First Ultra and the Last Thing on My “30 Before 30” List! I don’t know about you, but when 30 started creeping up on me, I made a “30 before 30” list of things I wanted to accomplish. Wednesday, I realized that I was going to accomplish every single thing on my “30 before 30” list with the exception on one thing: an ultra-marathon. I quickly got on the ol’ internet and discovered one more ultra in North Dakota scheduled in 2013, Bonus, the course is a mere 30 minutes away. One problem: it was in four days, on Sunday. Friday, at 7 pm, I registered. Two days later, at 7:45 am, I stood in the Turtle River Lodge and listened to the race directions for my first-ever ultra, the END-TRAILS 12-hour race, put on by ENDRACING. New to me, this event began with a pre-race meeting where we covered the basics of trail running (e.g. stay on the trail, pass off the trail, etc) as well as some trail-race specific guidelines such as the path (clearly marked with flags, orange tape and Halloween decorations). Since this was a 12-hour race, the race was not about who could finish the course the fastest, but the number of laps one could complete in 12 hours. My goal was a 50k, with any extra miles as a bonus (some had goals of a marathon, others of 50 miles). It’s hard for me to explain my expectations for this race. I’d found out about the race the Wednesday before and signed up on Friday. Saturday I went back and forth on actually participating in the race (vacillating like this is a complete waste of energy, by the way, since I ultimately knew I would show up). A part of me knew that an ultra-marathon was something to take seriously, and while my running as of late had been amazing (and I’d done a majority of it outside, in cold weather, but on roads), I did not, in any way, have the requisite mileage under my belt that I needed to be signing up for ultras. The other part of me missed the running community – and wanted to be a part of something bigger. I was craving that “race” feeling. Waiting for the race to begin, then, was very different than my marathons. I was relaxed and excited to see the trail. As the race started, I settled into a “long-run” pace, and followed the crowd on 200 yards of pavement before we hit the trails. For the first mile, the trail had slight undulations, but no steep inclines. It was beautiful, and the trees protected the runners from a majority of the North Dakota wind. I was averaging a 9 minute mile, which I knew was much too quick, but the course almost begged for a little speed at this point. After a mile and a half, the trail turned into the mountains, and immediately became much more technical. The undulations became mini-mountains with equally steep slopes and my pace slowed way down. 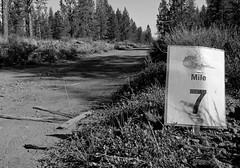 The exhilaration of running in such an amazing place kept my endurance high and as I made my way through the six mile (or so) loop, I found my pace settling into a 11:30 average for the course. This was much slower, of course, than my road runs – but I knew that if I wanted to sustain myself throughout the race, I needed to keep things slow. There would be no awards for speed today. At the end of the first lap, I was feeling pretty good. I’d completed the lap in a little over an hour, and my legs still felt strong, despite the quad-busting hills. I stopped at the lodge (no rushing through aid stations) to take a pit stop, drink four ounces of water, and grab a gel before heading out for the next lap. At this point, I was feeling pretty good, but the mental awareness that I had at least four more loops was starting to wear on me. Just as I was setting off to lap two, I ran into a runner who I’d overheard talking about someone that I knew from a local university. Since runners are a mostly friendly bunch, I introduced myself, thinking that it might be nice to talk to someone for a few miles (until they found my pace mindnumbing and set off). Instead, I met the person who would stay with me for a majority of the rest of the race! As we set off down the trail, we talked first about ultra-running, then triathlons, and, as a result, the second lap flew by. It was just as tough as the first lap, but having someone to talk to (especially about my first love, running) made the miles fly by. In fact, lap three flew by too. Nutrition note: I knew that a lack of water and nutrition would stop this ultra in it’s tracks. I drank between four and eight ounces of water at every pit stop (I hate carrying water, it’s an immature and rather lazy habit), and made it a goal to take in a Vega gel or a Pure Organics bar every loop. I didn’t have a single tummy issue on this run (maybe also because I simply wasn’t running fast enough too?) and I felt like my fueling and hydrating schedule was exactly right. It wasn’t until lap four that I started to feel the effects of the technical running. My feet were starting to hurt along the edges, I could tell I was losing a toenail (I’ll never have beach-ready feet), and my right quad was starting to suffer. Laps one through three we had not taken many walking breaks, except for the when the trail was super steep, but we started needing them more frequently in lap four after we passed the marathon mark. This was officially the farthest I had ever run. Because the trail was so technical, I’d made my new friend go ahead of me when we could not run side-by-side. It made it harder to hear him, but I was able to focus on his footsteps, which helped me to navigate the terrain (I still managed some pretty epic falls)! It also meant that he set the pace for me, which kept me from taking things too fast. I’m not sure that I could have completed the race if it hadn’t been for him; it would have been much longer and required way more mental strength. Lap five began after a lengthier pit stop and some hip and quad stretching. Both of my quads were feeling the hills (I read later that I needed to adopt a better hill posture so that my glutes took a majority of the pressure) and my feet were feeling pretty raw. My new running partner had only come out for a marathon today, so I knew I’d lose the company half-way through the fifth lap. After the marathon mark (and some high fives), the trail seemed noticeably harder and both of us began to get fatigued. Since he has an Ironman coming up, he took it easier, and at mile 28 (after some pictures) we separated so I could do my shuffle for the rest of the course. As I’d run the first few laps, I’d played with the idea of trying to run all 12 hours (and possibly hitting a 50 mile milestone) but by the end of the fifth lap, I knew that would mean much more walking and less running. Nevertheless, I set off on the sixth lap, afraid that if I stopped, I’d never start again. This lap was much more painful, and without someone to take my mind off of the though of four more slow loops, I started to dread the thought of six more hours of racing. In addition, every step uphill or downhill was shaky, and the idea of walking 14 miles became insurmountable. 50k plus six miles was still an amazing accomplishment (and 10 miles further than I’d ever run). At the end of the sixth loop, I called it a day, seven hours after I’d started. It was the right decision. 36 miles was 10 more miles than I’d every run before, and an injury wasn’t on my bucket list this year. I’d accomplished something I never thought I could – and can’t wait for the next one (but I’ll train this time). What’s the most impulsive race decision you’ve ever made? Ultrarunner, yoga teacher, academic, and feminist. I write about ultrarunning, feminism, and the intersection of running and life. Definitely! I’m learning that my body doesn’t have the resilience it did when I was 20 or when I trained for months before my marathons. I’m taking some easy and complete rest days! Congratulations! I’m doing my first timed race in a week and a half (Icebox 480 in Wisconsin) and it’s a first ultra for lots of people. I’ve done two 50Ks but am looking forward to seeing how well a 50K goes on an easier, less technical course. Format sounds similar to your race — 10K loop — and I hope I have as much fun as you did! Good luck! Sounds like a great course! Wow! Way to go! Glad to see you found a friendly rabbit (a tortoise maybe? since he kept you steady and slowed down). Thank you! I think I needed someone to keep my pace down and my mind off the miles! So impressive!! I am in awe that you just randomly signed up to it. Good plan to keep the pace easy and steady though. Running with someone is always a good way to ‘lose miles’.